Particularly when it’s in your home town, discovering a great new beer bar is always a joy, so we’re excited to be hosting this month’s members’ bottle share with the very lovely Steel Coulson, in Edinburgh’s waterside Leith neighbourhood. Particularly when it’s in your home town, discovering a great new beer bar is always a joy, so we’re excited to be hosting this month’s members’ bottle share with the very lovely Steel Coulson, in Edinburgh’s waterside Leith neighbourhood. Having previously been a slightly intimidating dockers’ pub, Steel Coulson now combines a lovely traditional look with an excellent selection of beers, with cask pumps proudly front and centre (though also a good line-up of keg taps, bottles and cans). As usual, we’re joined by eight of our most loyal local members to share some truly special beers from around the world. In the true spirit of a bottle share, the theme of tonight’s event is ‘beers that we liked the look of, with an accidental Belgian-ish theme’. Exciting times. After a round of Steel Coulson’s own excellent Golden Ale on cask to get everyone’s palates into gear, we kick off the proceedings with Cloudwater’s double dry hopped pale with Enigma and Ekuanot. It’s a zingy number with low bitterness but plenty of citrus and herbal notes. James Rodger-Philips picks up orange, while Colin Freeth ventures tangerine; everyone agrees that the citrus is definitely more peel than flesh though, with real zesty freshness. I get a hit of papaya, while intern Sarah Marks homes in on the dank, resinous, herbal character. This one is unambiguously about the hops though, whichever way you cut it. Next up is Acid Crush, a handsomely-canned collaboration between Norway’s Lervig and Belgium’s Oud Beersel. Several eyebrows rise at the prospect of an IPA/Lambic blend, but the result isn’t as challenging as we had perhaps suspected. There’s a definite funk at the end, and some sourness, but it’s generally well balanced with the IPA base. For Colin Banks, a fan of Lervig’s excellent standard IPA, it’s the hops that lead the charge, with the young Lambic adding layers of dressing. Continuing our Belg-ish odyssey, we have a bretted saison from Time and Tide. This is perhaps the surprise hit of the evening; none of us had tried it before and it defied a lot of our expectations. The brettanomyces character is clear, but not too heady, manifesting as a pleasant hay-like nose and flavour, which goes well with the soft and comforting saison. Sam Proctor is a fan of how sweet it is compared to some other drier saisons, while Mike Bentley praises its smooth and warming mouth feel. There’s a definite spice on the finish, along with the more usual banana and cloves, as Colin Freeth observes. Peter Buckley, not a saison fan generally, is converted. 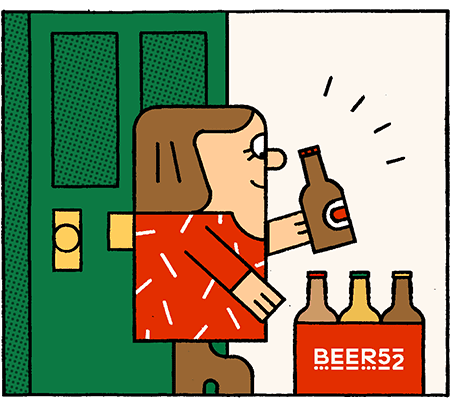 For our penultimate beer, I pull out a big hitter: a champagne bottle of Mikkeller Oude Geuze, created in collaboration with Lambic legends Boon. Just as I’m explaining how the introduction of young Lambic to old Lambic sets off Geuze’s characteristic secondary fermentation in the bottle, the (foolishly) uncaged cork explodes out of the bottle in my hand, waking everyone up. Rookie error. Safely into everyone’s glasses though, the beer is sensational. Sarah’s keen for everyone to rate each brew out of ten for some reason, and this one scores several tens. Like the best geuzes, it’s soft and infinitely complex, with layers of horsey brett, delicate sourness (including just a pleasant edge of acetic tang) and apple sweetness from the calvados foeders in which it was aged. Mark Dyson is particularly enthusiastic, praising its long finish and champagne-like subtlety. Our final beer of the evening – literally a showstopper at 13% abv – could not be more different. A maple-infused imperial stout from Stone Brewing, W00t Stout is a collaboration between Fark.com creator Drew Curtis, actor and internet deity Will Wheaton and Stone co-founder Greg Koch. Made with rye, wheat and pecans, and partially aged in whiskey barrels, it’s a viscous, tar-like beer, presenting a storm of flavours that compete for your attention, like a choir screaming insults in perfect harmony. Peter Buckley finds sweet espresso and dark chocolate, while several others comment on the dark, plummy fruit and the excess of nutty, cookies-and-cream richness. Colin Freeth finds the sweet treacle balanced by a soy-like umami quality, which receives nods from all around the table. For Calum Banks, this beer sneaks in at the last second to snag his brew-of-the-night.